Fun & fellowship is what it's all about. The open convention center layout will continue this year so that folks have greater access to pick, do business and network with one another in common spaces of the center. But there is SO MUCH MORE to take in. As always, you'll need to be registered to take part in professional development opportunities, the exhibit hall, official showcases and meal functions. We encourage everyone to support the organization that makes the week possible. Join IBMA, identify the events in the schedule that will help you succeed, and participate. Your peers want to see you there. They will be doing business with someone – why not you? The Business Conference will be held Monday-Thursday, Sept 24-27. This is the most affordable 7 - day conference you will ever attend. Full conference registrations begin at only $325. We're also offering a "four for the price of three" sale on full attendee registrations so gather some colleagues and save. Can't join us all week? Single day and a la carte tickets will also be available. Attendee evaluations say... "more emerging talent at official showcases." Expect to see new faces and discover exciting, new music at the official showcases. After Hours showcases will be presented from 10 p.m. – 1:30 a.m. While conference registration by participants is not required, we know there is a great benefit in participating in the events. Artists are encouraged to get the MOST of the time and money you've spent to get here by registering and being a part of professional development and networking opportunities. After Hours showcase hosts will be encouraged to only book talent who are IBMA members. BluegrassNation.org, a social networking and marketing database for bluegrass enthusiasts around the world, will be up and running and will be a continuing theme for the 2012 events. The Emerging Artist Educational Track will continue in 2012, with topics specifically chosen by new bands. And popular events like the Songwriter Showcase, Song Circles, Gig Fair, Mentor Sessions, Storytelling Sessions, Song Demo Listening and DJ Taping Sessions will return along with several member-suggested seminars, workshops and labs dedicated to cutting edge industry information and new trends. The IBMA will return to the historic Ryman Auditorium for The International Bluegrass Music Awards on Thursday, September 27—always a joyous night filled with unique moments you absolutely will not see anywhere else. And don't forget the Awards after party at the Hard Rock Café—a fundraiser for The Foundation for Bluegrass Music. Bluegrass Fan Fest wraps up the week with more than 60 acts, unique collaborations and not-to-miss reunions. Line-ups will be updated throughout the summer. Order reserved tickets early if you want to have the best seats in the house. The IBMA will be having a WORLD of fun at World of Bluegrass this year, and trust us...you don't want to miss it. Watch for the full World of Bluegrass brochure in your mail box later this month. Ticket sales begin June 1 at www.WorldPfBluegrass.org or by calling 888-GET-IBMA. "Nashvegas" is the Las Vegas of the South, offering a small town feel and big city fun combined with some of the greatest live music in the world—especially during IBMA's World of Bluegrass Week. Make your reservations now to stay at the convenient and comfortable Renaissance Hotel—close to all the World of Bluegrass action. 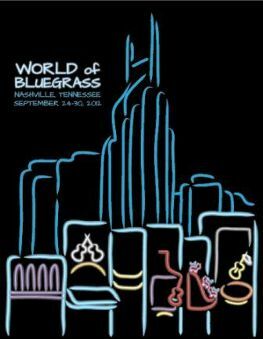 Click here to make your hotel reservations for World of Bluegrass, Sept. 24-30, 2012. Plan to come early and stay late, to enjoy everything the city has to offer.